What to Look For the Best Tactical Flashlight? If you benefit from the use of a tactical flashlight in your professional capacity, then you’ll have first-hand experience regarding the usefulness of certain manufacturers’ products and the advantages of those flashlights have over other brands. However, the absolute brightest tactical flashlight may just be out of your reach for a number of reasons, the most important of which will be explored below. 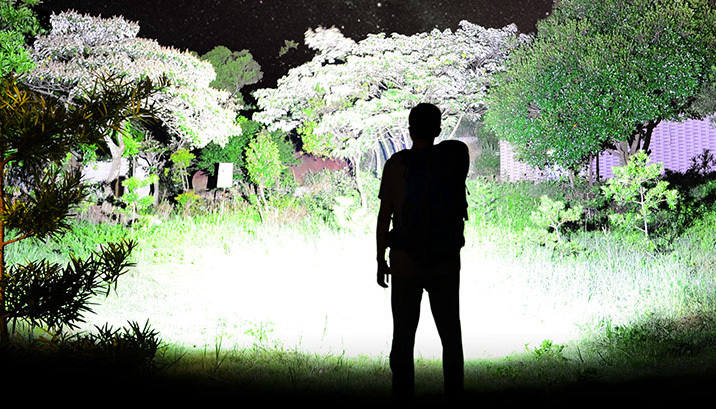 Whether you’re on the market for the best tactical flashlights for self-defense precautions, for general-purpose use around the house, for outdoor environments, or even for professional deployment, discover all you need to know about chasing the highest lumen rating through our tactical flashlight reviews and discussions. Battery: Two 18650 rechargeable batteries or four 3V CR123A Lithium batteries. Battery: 2 CR123A batteries required. 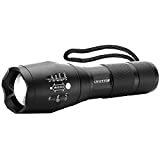 Although you can get a maximum brightness output of a whopping 2000 lumens, operating this tactical flashlight at the lowest setting is still enough to find your way around your dark house. The pack comes with lots of great accessories which include a smart charger amongst many others, but it’s perhaps the seven operational modes you’ll be most impressed with (Eco, Low, Medium, High, Turbo, Strobe, and SOS). If it’s a lot of light you want, that’s what you get in abundance with this tactical flashlight. It’s amazing! Usually, when a tactical flashlight output gets as bright as 2000 lumens, you know you have to compromise in many other areas. This LED tactical flashlight from NITECORE goes against that trend however because you also get decent peripheral lighting. In action, powered by original Nitecore NL 183 18650 batteries, you can rip through the thickest mist and if you drop the flashlight, 1.5 meters is how far the impact-resistance protects it. This is an extremely bright flashlight which adds up to some good value for the money you’ll spend. 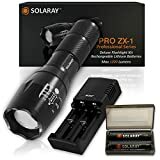 This professional tactical flashlight from Solaray weighs a mere 5 ounces, yet it packs a decent punch in terms of its light output and performance. We’re not sure about the 1200 lumen claims, but it is bright enough to get the job done well, featuring five modes; SOS, Strobe, Low, Medium, and High. It’s powered by two 3.7Volt 18650 batteries which come included, otherwise, you can use 3 triple-A batteries as well. Well, we can’t fault the manufacturers for producing a tactical flashlight that pretty much does what it claims. You get great output with this flashlight, running on batteries that give roughly the same performance in a 2800 Nitecore 18650 battery. This tactical flashlight only weighs 0.26 pounds, but will give you up to 1.25 hours of running time on the CR123A batteries (included). 630 lumens is more than decent and is a luminous flux claim which is refreshingly close to reality. If you are okay with giving up about 5% accuracy on any target you’re aiming to shoot at, at up to about 16 feet away, the flashlight’s bright spot can be used to replace your firearms aim. The mounted tactical light with the help of an sight attached to your handgun, the accuracy will be doubled. Perhaps not a tactical flashlight for professional law enforcement officials, but it very well could be with 640 lumens and a beam distance of 297 meters. It weighs 2 pounds but makes up for that relative weightiness with a surprisingly compact size. It’s also very durable and will give you a good four hours on one charge. It comes with a charger which allows you to also charge a spare battery simultaneously. Great battery life and solid brightness levels to make a good all-around tactical flashlight. Battery: 2 x 18650 3.7v Lithium Ion Battery Lithium batteries. At 1600 lumens, this is the manufacturer’s brightest flashlight and comes with a lot of accessories. It’s powered by 18650 lithium batteries for the best performance and the kit comes with a free mini LED flashlight too. It is indeed of professional tactical LED flashlight grade. This is a very bright flashlight which would definitely stun an opponent/attacker if shone in their eyes. Five light modes powered by three AAA-sized batteries or one 18650 battery can generate up to 1200 lumens, which is extremely bright. Don’t let the rather cheap-looking packaging fool you – it’s what’s on the inside that counts. If it’s good enough for professional law enforcement officials, then it’s definitely also good enough for activities such as camping and night-time patrols – as routinely completed by security personnel. This is a very powerful tactical LED flashlight which is just built for comfortable and effective hand-held use around the house, in emergency situations, outdoors, etc. Considering the amount of money you’ll spend to acquire this red tactical flashlight, it becomes clear that you’re getting every bit of value for every cent. It is extremely bright and is powered by one 18650 battery or three triple-A batteries. How bright is it? 2000 lumens bright, but it is some brightness which can be adjusted over different modes. It only falls short of being perfect as a result of the funky “memory” mode when you switch if off and back on again. It sort of cycles through the modes (goes to the next mode) when you switch it back on. Despite its red color, this is a great tactical flashlight that’s also extremely bright. 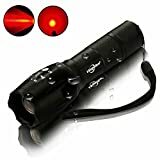 In fact, the brightness coming together with the red color makes this is a great tactical flashlight, especially to startle opponents. This tactical flashlight from Supernova falls within that rare bracket of flashlights with a brightness output of over 1200 to 2000 lumens. In reality, it’s hard to believe it actually is 1300 lumens. Compared side-by-side with other tactical flashlights, it appears to be nearer to 950 lumens, but it’s still a great tactical flashlight that’s very bright. This is a tactical flashlight which packs a lot of punch in its power. It’ll rival flashlights or torches of a bigger size. This is probably about as bright as a tactical flashlight indicated to give off 600 lumens can get as it is very powerful. Weighing a mere 0.35 pounds, it’s powered by 2 CR123A batteries, is waterproof and has three simple operating modes. This is a very powerful tactical flashlight which packs an insane amount of explosive power to be enjoyed for quite a while. It won’t last forever, but for its price the power it outputs can work out to a different tactical flashlight with less power, but lasting longer. It’s powerful enough to tear through tinted windows, making it a hit with night-time patrols-men. 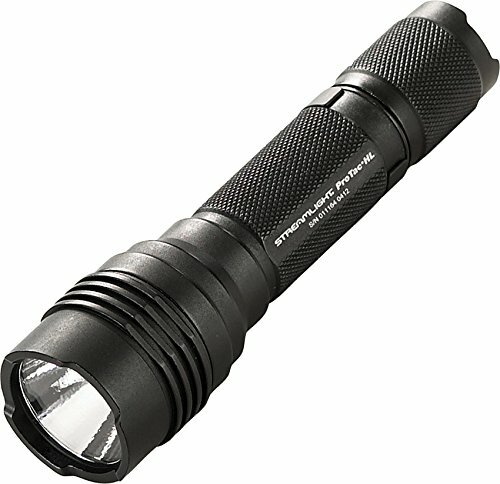 What are these lumens we keep referring to when discussing the brightness of tactical flashlights? It’s exactly that; the unit of measurement for brightness expressed as the rate at which light energy flows (luminous flux). The higher the rate at which this light energy flows, the brighter the beam produced by a tactical flashlight. A tactical flashlight indicated to output higher lumens is simply one which achieves its brightness through the use of a combination of a powerful power source (battery) and an LED which maximizes that power source to efficiently output a strong beam of light. Granted, as the title of this post suggests, we’re featuring the most useful tactical flashlights we could lay our hands on, but we were met with a bit of a quandary when it came to considerations of quality and performance. Tactical flashlight manufacturers are very quick to highlight the high brightness rating of their products in lumens, but the brightest units with the highest lumens don’t always necessarily equate to the best overall tactical flashlights. As with just about everything else with variable and measurable output and performance, brightness is indeed relative, even if in this case it can be measured. We’re pretty sure most consumers don’t have any reasonable cause to invest in the equipment that precisely measures luminous flux, so the next best thing is natural to rely on the brightness levels indicated by the manufacturers themselves. To establish some sort of uniformity, however, anything above 700 lumens can be comfortably referred to as being a bright tactical flashlight. 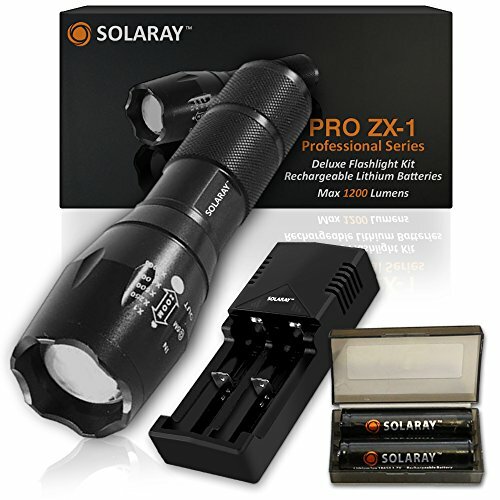 Our brightest featured tactical flashlights go up to a maximum of 2000 lumens and if you take into account the ‘tactical’ part of the equation, around 2000 lumens is perhaps the highest you can go without compromising too much on some of the other features which come together to make up what is considered a “tactical” flashlight. Yes, you get torches which can output around 3500 lumens or more, but then nine out of ten times these are indeed torches or lamps instead of tactical flashlights. With this consideration of the definition of the word ‘tactical’ in mind, it’s clear to see that there’s nothing tactical about a lamp or torch, so in terms of tactical flashlights, anything above 700 right up to 2000 lumens falls within the brightest tactical flashlights bracket. If you are active in the tactical division of the field of professional law enforcement, you’ll know all about the different tactical flashlight light modes and their significance. The same goes for military personnel, otherwise, if you’re just using your tactical flashlight for everyday uses and possibly for self-defense, you can still benefit from different settings such as SOS and Strobe. These settings naturally come in addition to the various brightness levels of course. So it goes beyond just looking at it as the absolute tactical flashlight passing off as the best one you can get. Two other terms associated with tactical flashlights are also thrown around a lot, namely throw and flood. These two terms refer to tactical flashlight light modes in a different way to the likes of SOS, Strobe, and brightness-adjusted modes. The Throw profile refers to a narrower beam which is usually stronger and illuminates further ahead of where you’re pointing it, but offers very little in the way of peripheral illumination. The Flood profile refers to light spread more widely from the lens of the flashlight, allowing you to see a wider field of view which is illuminated. Generally, the throw profile offers the brightest beam and some tactical flashlights which are adjustable in this way are only at their brightest and offer their highest lumen output at this setting. What You Should Know About the Tactical Flashlights? Naturally, as is probably the case with your reading of this guide, there are instances when all you really want is the luminous tactical flashlight you can get. 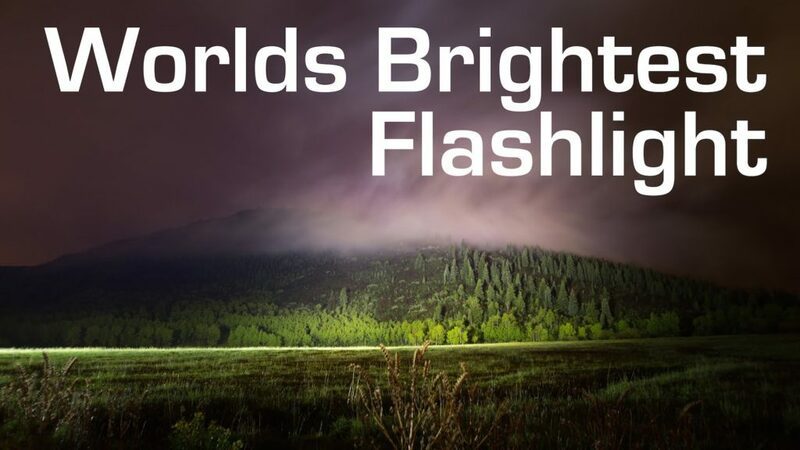 You don’t particularly care about anything else but the brightness, but even then there are a few things you need to know about what is perceived to be the good tactical flashlight. If a tactical flashlight is built for pure brightness and nothing else, you’ll almost always inevitably have to put up with some or other compromise. The most likely of these compromises is the lifespan of the flashlight, both in terms of how long you can shine it at maximum capacity and in terms of how long it lasts as a product. Even for an LED light to burn brightly at up to 2000 lumens, quite a lot of power needs to be consumed and so rechargeable batteries tend to work the best. LEDs themselves have a limited lifespan, so if you do use your tactical flashlight at full blast often, don’t expect it to last forever. With the many tactical flashlights we’ve tested, including some which we cannot consider to being “tactical” (not featured here), we found an inverse relationship between brightness and the “tactical” property of a flashlight. Yes, there are some stupendously bright torches and flashlights which shine at well over 2000 lumens, but then the tactical nature decreases because these flashlights get too big and bulky to use in tactical situations such as self-defense or as part of a law enforcement/military operation. 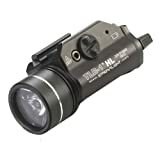 A lot goes into making a flashlight bright and in the case of tactical flashlights, everything that goes into making the lens emit brighter light needs to be fitted into a rather small unit. So usually if you want a better overall tactical flashlight, going just a few lumens lower does the trick. If you insist that you want the absolute useful tactical flashlight your money can buy, Shooting&Safety recommends you ensure ultimately make the best decision. The brightness of a tactical flashlight, or any light source for that matter, is measured in lumens, but you probably already know that by now. Now, if you’re looking for a flashlight to be used in tactical situations, the brightness levels which would be effective in that regard fall within the 700 to 2000 lumens bracket. Anything above 700 lumens is bright enough to achieve the desired effect, much like having a deer caught in the lights. 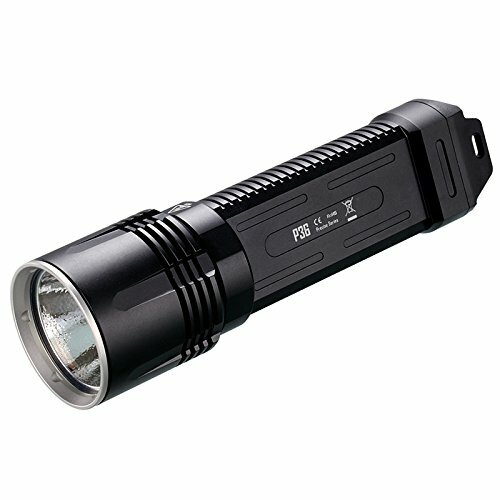 Professional law enforcement officials such as police officers and military personnel will mostly attest to 700+ lumens being enough to do the job they’re required to do, but if you’re planning to use your tactical flashlight for some other domestic and outdoor purposes, perhaps a minimum of 900/950 lumens will suffice. The 700 to 900 lumens range is still blindingly bright, but say for example you’re out camping or cycling, you could benefit from a slightly brighter flashlight which goes all the way to 2000 lumens. The same applies for tactical flashlights which are to be deployed in self-defense scenarios, such as shining it in the eyes of an attacker to stun them. Remember that in a typical tactical situation, whether professional or for self-defense, you’ll probably be using your tactical flashlight with a range of other firearm accessories, such as earmuffs maybe, or ar 15 scopes or with shooting glasses. This is when size matters, but fortunately when it comes to the tactical flashlights, manufacturers generally tend to make them small, compact and durable. They still pack a big punch, though, but there are one or two specific models which do tend to get a bit bulky. Are yo in search of hunting lights? Then read our predator hunting lights post. When it comes to gauging the value in the price of a tactical flashlight, it can get a bit tricky because a lot of tactical flashlights are sold as part of a complete kit. 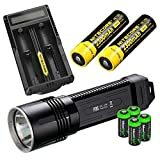 This kit normally includes extra accessories such as the batteries the flashlight uses, one or more battery chargers maybe, and even things like battery sleeves. This is what makes it particularly tricky to know for sure whether you’re getting good value for the money you spend. This is when some of your own discretion needs to come into play because as much as extra accessories such as battery chargers are good to have, they shouldn’t replace the intrinsic value of the actual tactical flashlight’s functionality. For example, does the market price of the charger included in the whole tactical flashlight kit mean you have to settle for dimmer flashlight (less lumen)? What if you bought the charger separately; does the isolated price of the flashlight then justify the price you’d pay for that flashlight if you bought it as a single item? Another way of looking at this consideration is the peak performance. 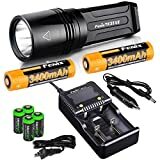 Some tactical flashlights indicated to output up to 1200 to 2000 lumens only achieve those levels if powered by specific batteries from specific manufacturers, usually produced by the same manufacturers of the flashlights themselves. So in this instance, it then becomes a matter of weighing up the cost of maximum output, i.e. is it worth using a cheaper battery if you’re not going to get the brightest lumen output? FENIX TK35 2000 LUMEN ULTIMATE EDITION (2015) LED $$$ 2000 Two 18650 rechargeable batteries or four 3V CR123A Lithium batteries. STREAMLIGHT 69260 TLR-1 HL HIGH LUMEN RAIL-MOUNTED TACTICAL LIGHT $$ 630 2 CR123A batteries required. 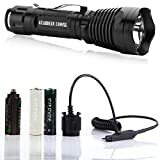 STREAMLIGHT 75458 STINGER DS LED HL RECHARGEABLE HIGH LUMEN FLASHLIGHT WITH 120-VOLT AC12-VOLT DC PIGGYBACK CHARGER $$ 640 1 Nonstandard Battery batteries required. 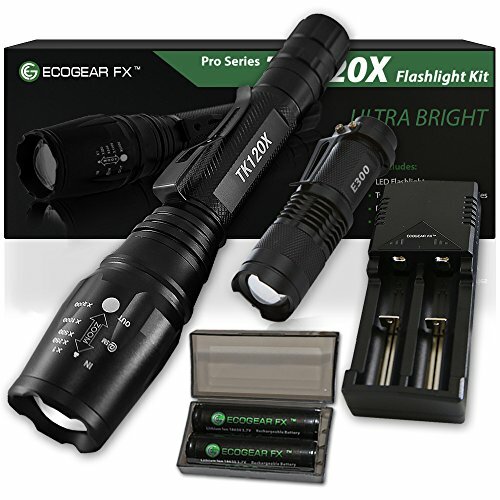 ECOGEAR FX PROFESSIONAL GRADE LED FLASHLIGHT KIT $$ 1600 2 x 18650 3.7v Lithium Ion Battery Lithium batteries. STREAMLIGHT 88040 PROTAC HL HIGH LUMEN PROFESSIONAL TACTICAL LIGHT WITH WHITE LED $$ 600 2 CR123A batteries required. So which brand/product/model should you settle on then if you are indeed on the hunt for the brightest tactical flashlight? Hopefully, these tactical flashlight reviews we put together for you will edge you closer to the right decision for you, but what’s important is to keep in mind that it’s not a matter of just going with the flashlight indicated to output the highest lumens. The best tactical flashlight with the highest output of up to 2000 lumens is only as effective as it can stay on at those levels. At the end of the day, it’s all about consistently maintaining a high level of brightness for the longest time possible.